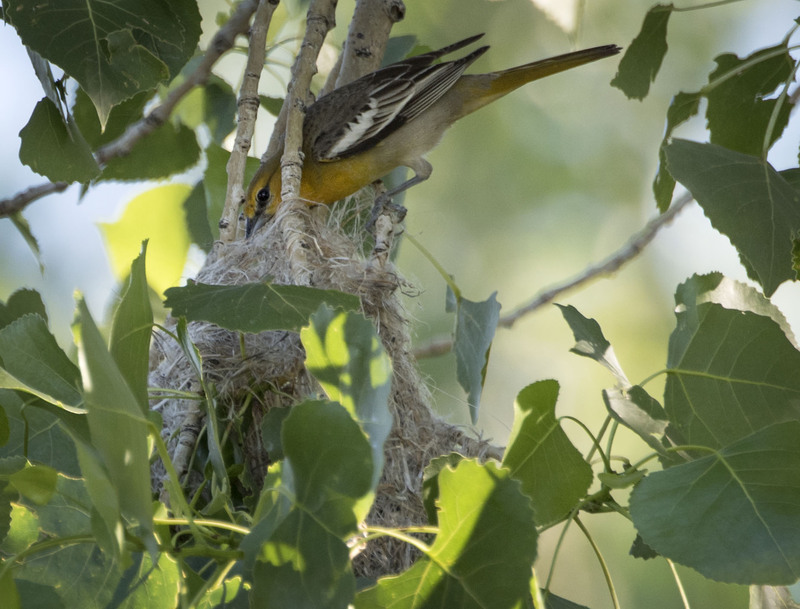 Earlier this summer we got lucky and happened to walk under a nice old cottonwood tree and heard the unmistakable sound of little newborn birds chirping away for food. 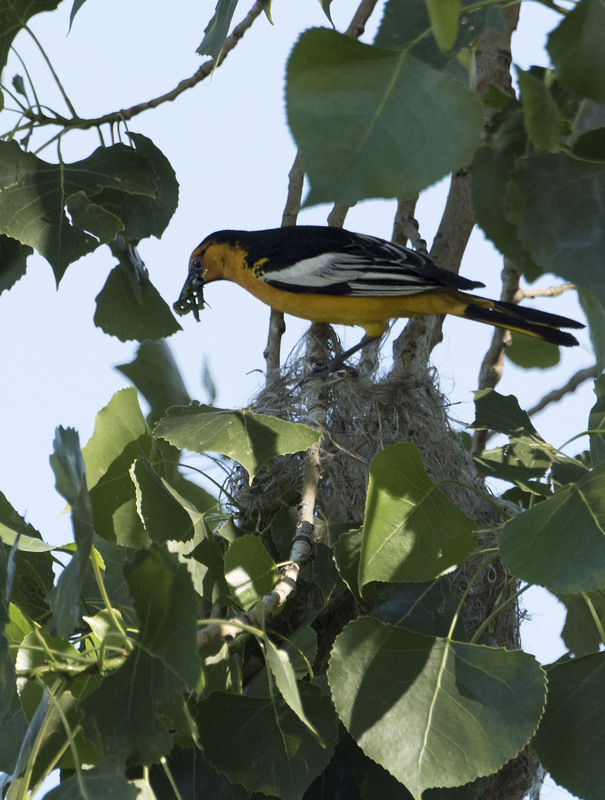 The nest in the tree belong to a family of Bullocks Orioles and like all oriole nest was well hidden in the leaves of the tree. It was amazing how rapidly the parents would fly into the tree, deliver the meals, and then fly back out making it somewhat difficult to get a photo or two. Both parents we equally active in delivering meals to the kids. Above the male delivers some freshly caught bugs. within minutes of the males departing Mom flew in and delivered another meal for to the growing chicks. If this meal is any indiction of what the kids were eating I think the youngsters were well fed that day. The youngsters have fledged and the nest is long empty now as another summer has come and gone. 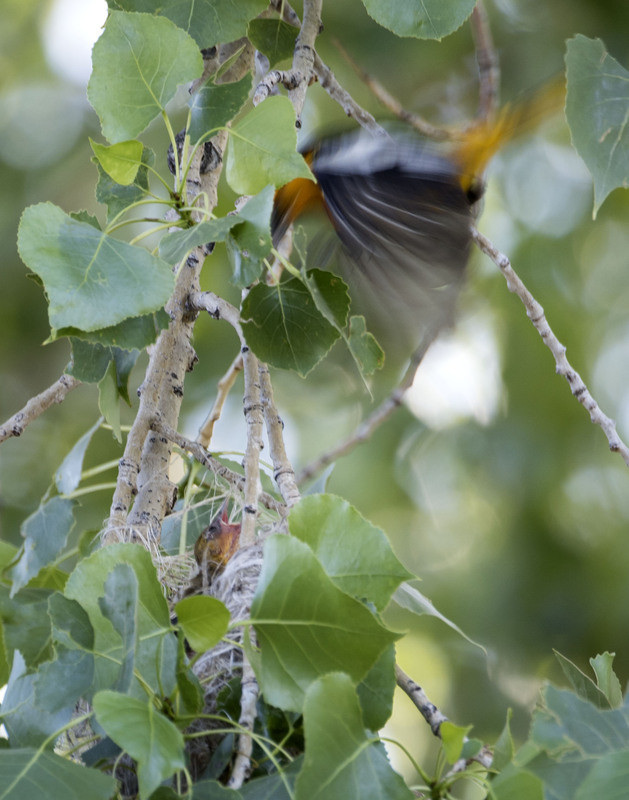 Fantastic photos, Mike, what a treat to have found this busy nest. It looks like it’s made with debris from the cottonwood. You found a gem. HI Jet and thanks. 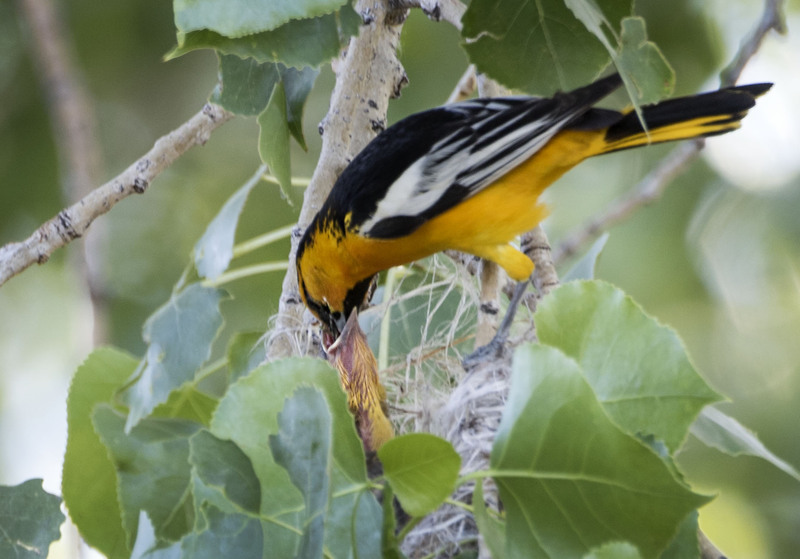 It is always amazing to see oriole nest and wonder how that pouch hanging from a tree both gets made when you only have a beak and how it is able to hold and support several young orioles. A lovely set of photographs! Thanks, we had fun watching them buzzing and out with food for the kids. Hope they nest in the same area next summer. I enjoyed these. Great captures. Thanks Sherry, it was fun to get the opportunity to see them feeding their kids. Yum, worms! 😉 Great shots, Mike. How lucky to be able to catch them feeding. Not something people get to see everyday.